For a recap of Gateway BioBlitz Events, visit the NPS Gateway BioBlitz Events site. For additional Sandy Hook information, visit the NPS Gateway Sandy Hook site. The American Littoral Society (ALS), in partnership with the National Park Service (NPS), Rutgers University, and the New Jersey Sea Grant Consortium, organized the first BioBlitz of Sandy Hook from 3pm Friday, September 16th through 3pm Saturday, September 17th 2011. A Bioblitz is part contest, part festival, part educational event, and part scientific endeavor. The concept was developed by world renowned entomologist and champion for biodiversity, Edward O. Wilson. The Sandy Hook Bioblitz created a hands-on opportunity to educate the general public about the biodiversity of species found in this popular coastal area and demonstrated that biodiversity matters in our own back yards and not just in exotic locales. 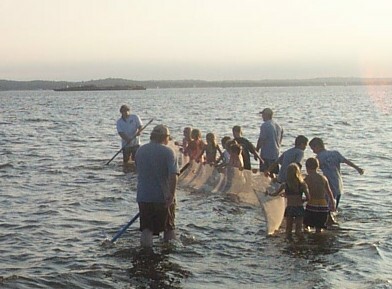 It provided unique opportunities for biologists to collaborate with colleagues and students across many disciplines and for students to work in the field with experts as they gathered important data about coastal biodiversity that can be shared with others. This event engaged nine teams of scientists, amateur naturalists, and volunteers in a 24-hour race to see how many different species each team can identify on Sandy Hook before the clock runs down. The data provides a snapshot of how many different species are present – or the biodiversity of Sandy Hook. Collected at regular intervals over time, these snapshots provide important clues about changes in biodiversity caused by climate change, sea-level rise, and other human impacts on the unique ecosystem that is Sandy Hook. While the scientists were out in the field, the American Littoral Society and colleagues presented complementary educational events for the general public. These included a Jr. Bioblitz, Midnight Moth Hunt, seining and more—all designed to whet the appetites of young people for the natural sciences. Scientists, Amateur Naturalists, Volunteers Needed! Scientists, amateur naturalists, and volunteers worked together in 4-hour shifts during the bioblitz. Volunteers: adults, students; collect data in the field, as well as help with photography, GIS, and base camp activities. Applied Consulting Insurance Agency, Inc.
Asbury Park Press, EnviroGuy: Sandy Hook BioBlitz finds 433 species of plants, birds, etc. The American Littoral Society Headquarters [map, directions] located in the Fort Hancock Area is the "Base Camp" where registration and all public activities will take place. Here, we will have the scientist tent, tally board, and serve water and refreshments throughout the 24-hour period. From here, groups will go out to survey various locations within the Gateway National Recreation Area in the vicinity of Sandy Hook. Saturday September 17 at 4:00pm. Scientists will describe their findings. We will have a group of Scientists in their fields to lead taxon groups, but we are looking for Amateur Naturalists and Volunteers to help with the surveys and registration. All Scientists, Amateur Naturalists and Volunteers must register via the registration form. Also, you must fill out a volunteer service agreement form #1, along with a photo release form. You need to bring the registration, volunteer service agreement, and photo release forms with you to the registration table at the "Base Camp" in order to participate in the BioBlitz. On-line registration is closed. You can still register by downloading the registration form [PDF] and bringing it with you to the registration table at the "Base Camp". For those who registered via on-line registration submission, check the Team Schedules for updated names and assignments.